Pixar has done it again. It’s a clichéd statement but one that fits like a comfortable pair of shoes. After a few hiccups (like the misguided “Cars 2” and the Oscar-winning but ineffectual “Brave”) Pixar has made a triumphant return to what Pixar does best: creating astonishingly entertaining and clever stories set in the unlikeliest of places. “Inside Out” might be quite literally their most cerebral animated flick yet but it also is just as funny, ingenious, and emotional since their hot-streak trifecta of “Wall-E,” “Up,” and “Toy Story 3.” “Finding Nemo” remains my personal favorite (and "Cars" is disturbingly underrated) but “Inside Out” comes darn close to capturing the sheer joy of seeing that film for the first time. “Inside Out” tells two stories: it’s about a young girl named Riley who has a perfect life until her family moves, and the other is taking place entirely inside Riley’s mind where her emotions are personified and anthropomorphized into some of the funniest and most clever characters Pixar has ever imagined. “Inside Out” is the creation of co-directors Pete Docter and Ronaldo Del Carmen who have crafted a delightfully witty and emotional story about growing up. Inside young Riley (voiced by Kaitlyn Dias) are five main emotions: the control freak leader Joy (Amy Poehler), the gloomy gal Sadness (The Office’s Phyllis Smith), the worrisome Fear (Bill Hader), the temper tantrum throwing Anger (Lewis Black), and the Mean Girl-as-emotion Disgust (Mindy Kaling). To say these five characters are perfected cast and performed is an understatement. Joy, as the unofficial ring leader of the group, operate in Riley’s brain in a control room type command center where memories are created in form of small spheres. Many of them are yellow-colored because they’re happy memories. When Riley is angry Anger takes over the controls, shen she’s frightened it’s Fear at the reins, in a very literal representation of basic human experience. By the end of the film you’ll be wondering what the personified characters inside your own brain may be like. 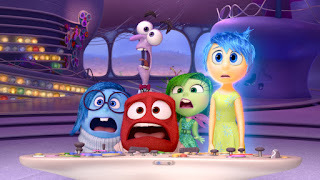 The film’s inner mind plot becomes complicated when Joy and Sadness are accidentally sucked out of the control center and must find their way back leaving Anger, Disgust, and Fear to take control. Without Joy and Sadness will the now apathetic Riley ever snap back into the joyful girl she once was? Holy smokes, “Inside Out” is a delightful yet deep instant animated classic. Every single person responsible for this amazing film is in simply top form. This is arguably the studio’s most original and fun and emotional film since “Finding Nemo.” Pixar is so good at literalizing things in ingenious ways. For instance, at some point Joy and Sadness attempt to ride Riley’s “train of thought” back to headquarters which is an actual train. They have delightful, almost Alice in Wonderland encounters including the movie’s unsung hero Bing Bong (Richard Kind) as Riley’s imaginary friend and a fascinating yet dangerous excursion into “abstract thought” where the animation becomes just as abstract. And what about Riley’s dreams that are setup like a Hollywood movie studio complete with writers, directors, and corny movie sets and props? Every single bit works extremely well and it’s all wrapped up in an exciting story that hits emotional levels not unheard of in a Pixar film. Feature Trailer for Inside Out on TrailerAddict.